The ELISA kit for the detection of Trypsin (TRY) was successfully validated with porcine pancreas as positive control. A clear signal was observed in this samples while none could be detected in the negative control chicken serum. Additionally, the ELISA kit for the detection of Ki67P was tested successfully with a lysate of MCF7 cells. Ki67P is of great significance as a nuclear marker for cell proliferation since the Ki67 index can serve as measurement of the proliferative rate of cells, including tumor cells. The negative control in this experiment was a chicken brain lysate . Since we started the initiative we have successfully validated 92 products. The first was a anti-Fibrinogen antibody, followed by a couple of other interesting antibodies and ELISA kits. 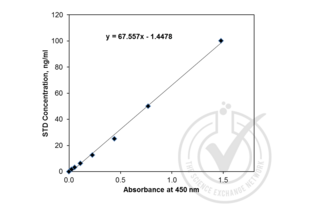 The latest succesfully validated products were the ELISA kits for the detection of Trypsin (TRY), and Ki67P. A few more products are currentlly being validated. Further validated ELISA kits can be found here: "ELISA kits"
Here is a full list of successfully validated products: "all successfully validated products"